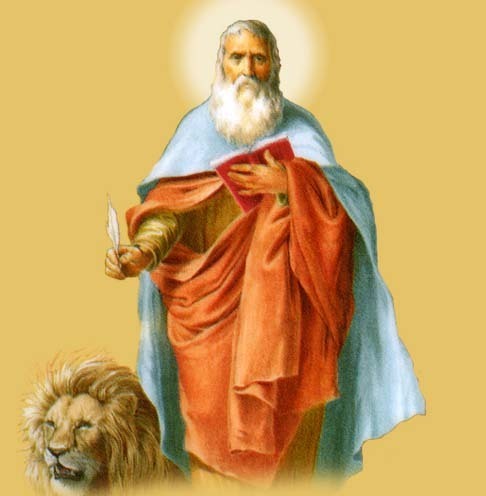 St. Mark was associated with St. Paul and St. Barnabas (who was his cousin). He accompanied St. Paul on his first missionary journey and later went to Rome with him. He also was in Rome with St. Peter as a disciple of his. It is said that St. Peter’s teaching was the basis for St. Mark’s gospel. Mark is said to be the founder of the Church of Alexandria. The stone rejected by the builders has become the cornerstone. Which angel announced the birth of Jesus? 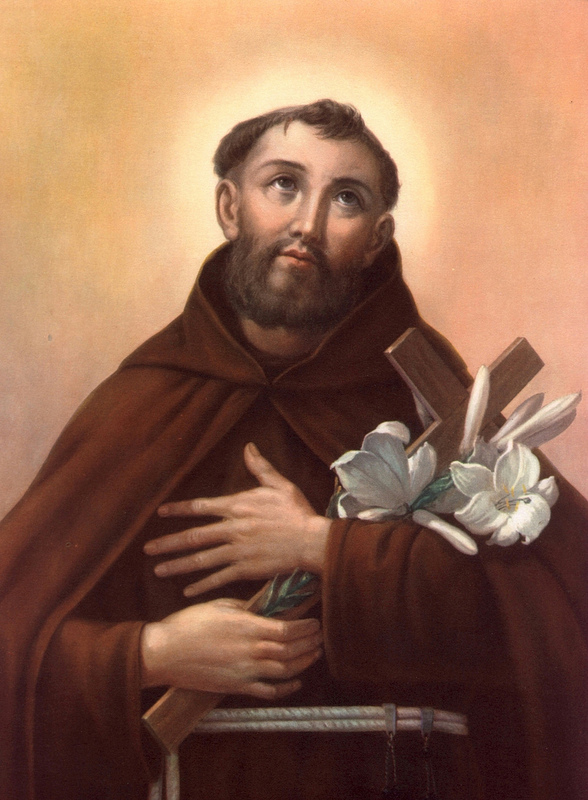 St. Fidelis of Sigmaringen was born in 1577 at Sigmaringen, Switzerland. He received Holy Orders in 1612 and entered the Capuchin Order at Fribourg. He changed his name, Mark, to Fedelis. He, and eight of the Fathers, undertook the Mission among the Calvinists in the Canton of Grisons in Switzerland as requested by the Congregation of Propaganda. In spite of the fact that his life was threatened, he preached and made many converts. He had a premonition that he would be martyred and spent much time at the foot of the altar or before his crucifix praying. He made his confession on April 24, 1622, said Mass and preached at Gruch. He seemed in an ecstasy at the close of his sermon and foretold his death to several people. A Calvinist in Sevis fired at him but without effect. When faced with 20 Calvinist soldiers with a minister at their head he refused to embrace Calvinism. He said, “The catholic Religion is the Faith of all ages; I fear not death.” After a blow on his head which knocked him down, he rose to his knees and prayed for his persecutors and with the names of Jesus and Mary on his lips he received the death-stroke. O Lord, our God, how wonderful your name in all the earth! 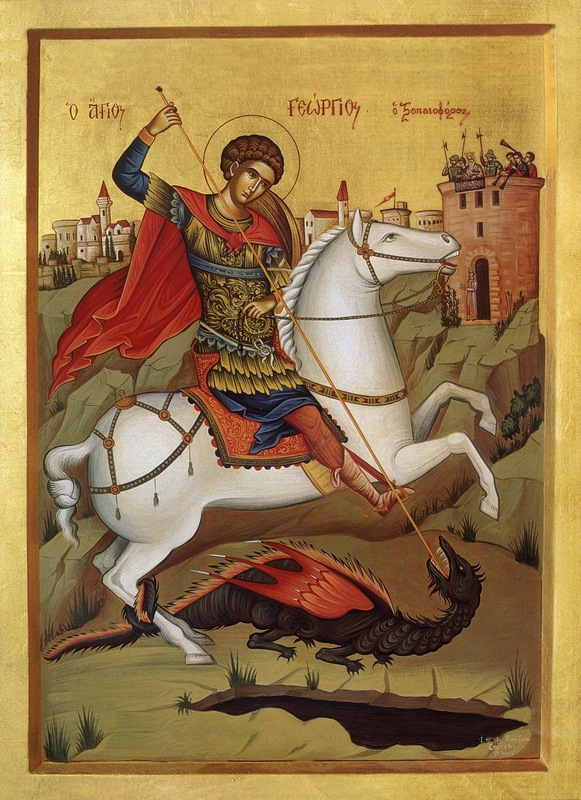 Among the Greeks, St. George is called “the Great Martyr,” and his feast is kept as a holy day of obligation. The devotion to him can be traced at least to the 5th century. But, one of the oldest churches in Constantinople is dedicated to his honor at an earlier date, which would be much earlier. Ancient heretics have cast much obscurity over his life. It is told that he suffered martyrdom during the persecution under Diocletian at Nicomedia in the 4th century. He was said to be a soldier so his intercession is asked especially in battles. He was chosen as Patron Saint of England and Edward III instituted an order of knighthood in his honor. He is usually represented as being in battle with a dragon. He died about the year 303. Rejoice, O hearts that seek the Lord. To what king in the Old Testament are many of the Psalms attributed? Little is known of both these saints. Soter was born at Fondi, Italy. He was Pope around 167, succeeding Pope St. Anicetus. He opposed the Montanist heresy. He was known for his charity, according to a letter of Bishop St. Dionysius of Corinth. Unreliable tradition claims St. Caius was a Dalmatian and related to Emperor Diocletian. He became Pope in 283. He decreed that bishops must be ordained priests before being consecrated Bishops. He fled to a cave when Diocletian’s persecution of Christians began. He lived there for eight years until his death. All of this is unreliable since Diocletian’s persecution didn’t begin until six or seven years after Caius’ death on April 22.
Who has the primary responsibility for the education of children? 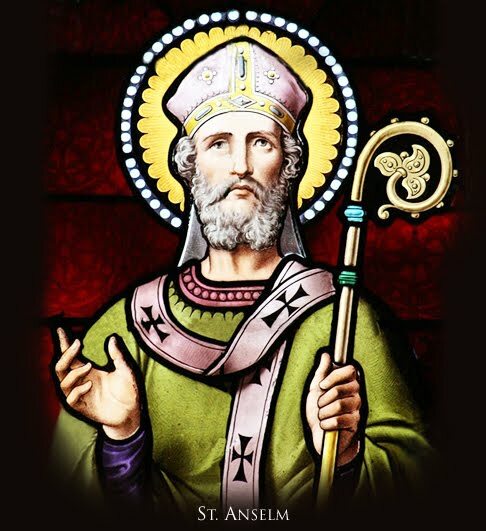 Born in Piedmont of noble parentage about the year 1033, St. Anselm studied under Lanfranc at the monastery of Bec. He was made Prior in 1063 and Abbot in 1078. He was well known in England because of his various voyages there. He became Archbishop of Canterberry. He resisted the unjust measures of King William Rufus which caused the King’s anger. He spent some time in Rome where he composed a work on the Incarnation. He assisted at the Council of Bari. His prayers prevented the Pope from excommunicating the King of England. He did not return to his See until after the death of King William Rufus. He took another trip to Rome due to differences with the new King. He returned to England in 1106 and died in 1109. He wrote works that deeply influenced Catholic philosophy and theology. He is best known for his ontological argument for the existence of God. Keep me safe, O God; you are my hope. Where is the basic place for learning moral values? Born in Gracchiano-Vecchio, Tuscany c.1268, St. Agnes entered the convent at nearby Montepulciano when she was only 9 years old. She was transferred to the new convent which opened at Procena and soon became the abbess at age 15. By her sanctity and the austerity of her life, she attracted many postulants. The inhabitants of Montepulciano built a new convent and inspired her to come back. She became prioress. She adhered to the Dominican rule. She was famous for her visions, experienced levitation, and performed many miracles. (It was reported that she had received Communion from an angel and held the infant Christ in her arms). She died in the convent and was canonized in 1726, April 20. Only a democratic form of government is morally acceptable. True or false? Also known as Alphege. Born to noble and virtuous parents, he entered the monastery of Derherste in Gloucester at an early age. He left to become a hermit at Bath. He was appointed Abbot there and enforced a strict rule. Despite his objections, he was appointed Bishop of Winchester. He eliminated poverty in his diocese through his aid to the poor. He was appointed Archbishop of Canterbury by Pope John XVIII in Rome. The Danes were pillaging the country and the Archbishop hastened to the scenes of pillaging and killing and tried to turn the cruelty of the pagans to himself. His cathedral was burned and he had to endure great tortures and was put in prison for months. He refused to use the goods of his church for his ransom so he was put to death while he prayed for his enemies. He died April 19, 1012. Lord, send out your Spirit, and renew the face of the earth. One cannot be morally upright without also being virtuous. True or False? In the year 180, Commodus, a vicious prince, ascended to the imperial throne after the death of his father, Marcus Aurelius. He wasn’t cruel toward the Christians. He relaxed the severity of the laws. St. Apollonius joined the ranks of influential Christians, a man of importance and learning. 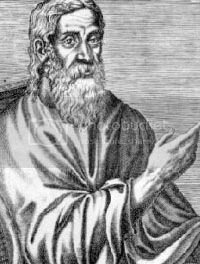 Due to an obscure law which decreed that accusers of Christians be put to death, Severus, one of Apollonius’, slaves accused him of being a Christian and was put to death. The judge sent an order to St. Apollonius after the execution of Severus, to renounce his religion. After he refused he was referred to judgment of the Roman Senate. St. Apollonius then composed the following apology and pronounced it before the Senate. “We have hastened to honor Him because we have learned lofty commandments from Him….Yet if it were a delusion (as you assert) which tells us that the soul is immortal and that there is a judgment after death and a reward of virtue at the resurrection, and that God is the Judge, we would gladly be carried by such a lie as that, which has taught us to lead good lives awaiting the hope of the future even while suffering adversities.” Despite this magnificent apology, St. Apollonius was beheaded for refusing to deny his Faith. What action must one perform after confession to make amends for sins? St. Stephen was born at Dorset, England in the second half of the 11th century. He was educated at Sherbourne Abbey. He grew to be a man of great charm and a first-rate scholar. He became a monk at the Abbey of Molesme. There he and the Abbot, St. Aleric, and St. Robert worked with zeal for reform. 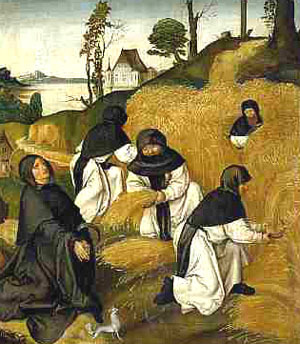 The three monks along with 20 other monks lived a life according to the Rule of St. Benedict. When St. Aleric died in 1108, St. Stephen became Abbot of Citeaux and built up the community. They endured many hardships. St. Bernard arrived there with thirty of his followers in 1112. During the next eight years a dozen more Cistercian houses were built to house all those who came to them. The spirit of the Cictercian Abbey was defined by the “Charta of Charity” which St. Stephen wrote in 1119. His high ideals, character and simplicity mirror the great saint who ruled the monastery for 25 years. He resigned his position because of his advanced age and near-blindndess. He died March 28, 1184. Our blessing-cup is a communion with the Blood of Christ. Where on the body does the bishop anoint with oil during confirmation? Bernadette’s parents lost their mill in Lourdes, France through mismanagement and laziness. When Bernadette was about 14, they could only afford to live in a dank, unhealthy cellar that had once been the town hall. Her sister said that Bernadette was sickly all her life. Not only did she have asthma but she ate very little. The story of her visions of the Blessed Virgin Mary, (18 in all) in a grotto known as Massabeille are very well known. Her family wasn’t sure of her story and Sr. Marie Therese Vauzous, her teacher, made fun of her. The police tried to force her to admit that she was lying. Her pastor also rebuked her for causing such a commotion. Our Lady directed Bernadette to uncover a spring in the grotto and the people who bathed in the spring had miraculous cures. People begged her to touch them to cure them and offered money for this but she refused. She entered the convent of Sisters of Charity of Nevers, to get away from this attention. The Mistress of Novices was Sr. Marie Therese, the nun who had mocked her at school and who still thought that she was guilty of trying to fool the world. She took final vows in 1878 and shortly therafter she contracted tuberculosis of the bone which is an incurable and painful disease. To the end of her life Sr. Marie Therese refused to believe that the visions were authentic. Lord, in your great love, answer me. Who was the Roman procurator who condemned Jesus to die on a cross?